Runs Bigaria-label="A rating of 1 means too small, a rating of 5 means too big, a rating of 3 means true to size. This items average rating is 5.0. Men's Ariat® 13" Tombstone Cowboy Boots. A stand-out edge, and comfort, too. The footwear answer on the ranch, at the office, in the warehouse, and any other work environment... and beyond. With a stitch pattern and embroidery accents for that authentic Cowboy look. Then there's that coveted worn-in feel from the first time you pull them on, for an all-day comfort that lasts long into evening hours. Plus, the built-in ATSTM technology for stability and comfort is proven to reduce stress and shock to your feet, lower legs and back with a foot-conforming gel-cushion insole and composite fiber forked shank, for 3 times the stability of a typical steel shank. Crafted by Ariat®, America's number one western boot brand. Each approx. 13" h., 39 ozs. 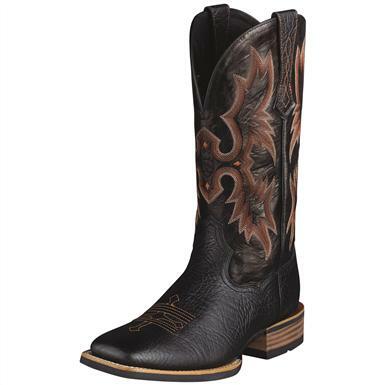 Mens Ariat 13 Tombstone Cowboy Boots, Black is rated 4.3 out of 5 by 74. Rated 4 out of 5 by Ronw 74 from Very good quality but they were too big and the square to was to wide,it do look right. Rated 5 out of 5 by VikingVince from Stylish and comfortable I've had these a few weeks now, and they're great so far. I had to go to a Western store in NJ to try on a pair before I ordered, because here in PA all we get are English stores for some reason, and I wanted to make sure I ordered the right size. Anyway, I've worn them every day since they arrived, and even got caught in a snow/rain storm. They're comfortable, they look great for non-exotics, and as a bonus my feet stayed dry during that storm. I love the orange contrast stitching, it really gives these a bit of a tough look, however it is hard to tell what they actually look like online. I expected the colors to be slightly different, but I am not displeased. They're black on the bottom, and more of a dark brown on top with the orange and tan stitching. They broke in fast, and they clean up easily, I normally wear a size 12 in almost everything, but these are 11.5 and they fit perfect, with a bit of extra room for thick socks (essential here in PA)Bottom line: I wish they had better pictures online, but they look every bit as good in person, they're comfortable, they fit well, and seem high quality. The shipping was SLOW though, but it was free, so no complaints. Rated 5 out of 5 by woverto44 from great boot, detail, construction Got these for Christmas almost a year ago. I wear a 15 sneaker, but the 15 Tombstone is just a tad too big. I'd order a half size down, but they don't make half sizes that big. Other than that, great boot. Had to break them in for sure (don't expect extreme comfort out of the box), probably wore them 10 times before significant molding took place in the sole and heel cup. After wearing, great feel. The ATS is a firmer sole than my brother's pair with the 4LR sole. Wouldn't work in them for sure. Love the wider square toe. Incredible stitching and detail. Leather looks great after wear, I just condition and polish after wearing them a few times a week. My first pair of Ariats. My brother and father have both purchased a pair of Ariats because they loved mine so much. Probably won't buy another brand ever again. Rated 5 out of 5 by Kyle S from Surprise, there’s no break in needed. This is the first pair of western boots I’ve owned. I’ve owned other leather soled shoes and boots. The break in always took time. This boot, fresh out of the box, feels pretty well broken in on the footbed. I would definitely recommend this item if you’re looking for a comfortable and well constructed western style boot. Rated 1 out of 5 by Idaho from Wouldn’t recommend for much use I bought these boots to wear everyday at work and after 6 months the leather is separating from the sole, and the toe rubber is broken off. Leather seems to be much thinner and more brittle than other boots I have bought for the same or less price. I wouldn’t recommend for someone wearing them daily. Rated 1 out of 5 by Lady MacGyver from 2 Pairs and still squeaking! I bought these boots because I wear a size 12 narrow. The fit was great and I loved them for about a month and then the left heel started squeaking loudly. Sent them back and got another pair. Guess what? A month later and the left heal starts squeaking again. You lost me. I’ll spend $300 for a boot that doesn’t squeak. Ariat, 10% of your boot reviews are about squeaking heels on your boots. Sounds like a problem. Fix it.